Weather conditions impact land application of manure. Wet soils hinder equipment from accessing fields. Regulations prohibit application on frozen or snow cover soils. Uncertain soil and atmospheric conditions can cause the best plans to fail. Nutrient management plans that are expected to succeed might fail given any particular year’s weather. Incorporating fieldwork days information into nutrient management plans can make them more robust to uncertain weather conditions. The USDA publishes the number of fieldwork days for different crop reporting districts within states. These data are from field reporters who provide their opinion on the number of days that were available for farmers to conduct fieldwork such as disking, planting and harvesting. USDA Fieldwork Days data cover the growing season (approximately April to December). Estimates of fieldwork days do not exist for the non-growing season (approximately December to April). However, certain states have agricultural weather station networks that collect soil temperature and other critical information that can be used to estimate the number of fieldwork days that exist for manure application within regulatory limits. This project integrates fieldwork days from the USDA Fieldwork Days data with the Missouri Agricultural Weather Station Network winter soil temperature and precipitation data for the corresponding crop reporting district. This compiled database gives a complete year of fieldwork day estimates. The data are used in a model that allows nutrient management planners to incorporate climatological impacts into their land application plans. Users specify their equipment complement and size, quantity of manure, and desired beginning and ending dates. The model reports output in a cumulative distribution function that estimates the probability of completing fieldwork within the specified parameters and a sensitivity table of ending dates. Why Consider Fieldwork Days for Nutrient Planning? We currently have no mechanism to evaluate the feasibility of implementing nutrient management plans. A plan that successfully finds sufficient fields for using nutrients in manure may fail because there is insufficient time to apply manure with the designated equipment. Incorporating fieldwork day information into the nutrient management planning process could make plans more robust, informing the planner and farmer how likely the plan will succeed. 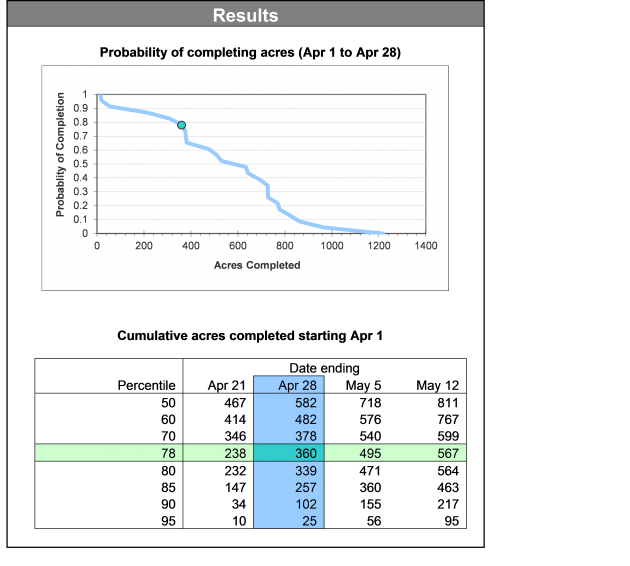 This project developed two spreadsheets that help nutrient management planners incorporate USDA and climatic data into their plans to estimate the likelihood of successfully completing the plan objectives. 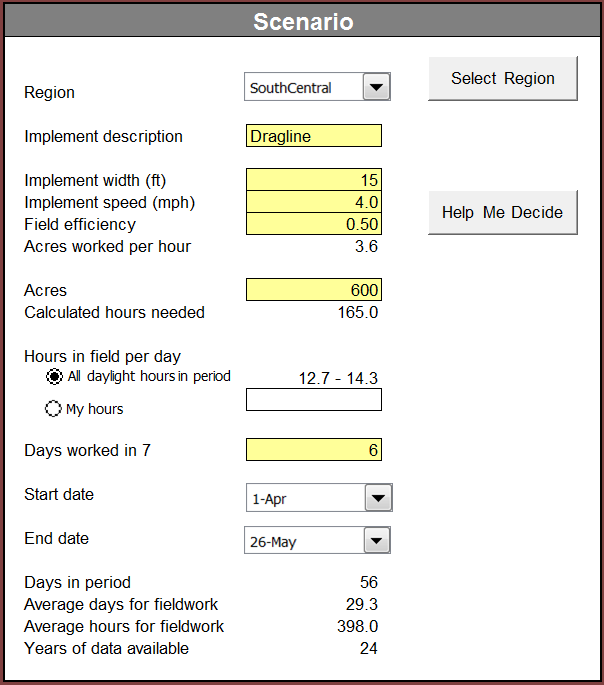 The first spreadsheet incorporates fieldwork day data from the USDA with machinery management decisions to estimate the probability of completing manure application within a planned window. This spreadsheet and data report the number of days in a week when fieldwork can be done in various regions of the state during the period April through November. The second spreadsheet integrates soil temperature and precipitation data from the Missouri Agricultural Weather Station Network to estimate the probability of completing manure application within a planned window during the months of December through March period. Users specify their equipment complement and size, quantity of acres receiving manure, desired beginning and ending dates for manure application, and hours per day and days per week they can apply manure. The model reports output in a cumulative distribution function that estimates the probability of completing fieldwork within the specified parameters and a sensitivity table of ending dates. Sample output of the probability of completing necessary fieldwork. Plans do not normally consider the feasibility of accomplishing manure application within an appropriate time frame. Missouri fieldwork day data indicate that time available for field work varies significantly over the year and within the state at any given time. For example, a nutrient management plan that requires 100 hours of application time in northwest MO during the month of April would be successful 78% of the time. The same nutrient management plan needing 100 hours of fieldwork during February would be successful 40% of the time. In April the median number of fieldwork days 11.5 days compared to 8.3 days in February. Sample imput screen for describing the manure application parameters. We will expand the tool beyond Missouri. We are looking for funding opportunities to integrate it into our nutrient management plan document generators. The spreadsheets that incorporates fieldwork days into manure management decisions can be obtained at swine.missouri.edu/manure/ under the link names of Probable Fieldwork Days and Probable Winter Fieldwork Days. Scott Gerlt and Brent Carpenter of the Food and Agriculture Policy Institute created the initial spreadsheet tool.